Whether attempting to escape or simply traveling at night to visit friends or family in neighboring plantations, African-American slaves were threatened by the slave patrols. These squads, often including non-slaveholders who were required to serve under state law, were notorious for their brutality. Most feared were the dogs the “pattyrollers” used to track down fugitive slaves. 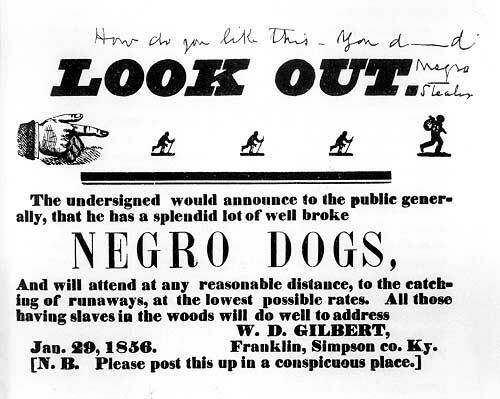 This 1856 advertisement promoted the sale of dogs trained expressly to hunt human beings. Source: Abraham Chapman, comp., Steal Away: Stories of the Runaway Slaves(1971).